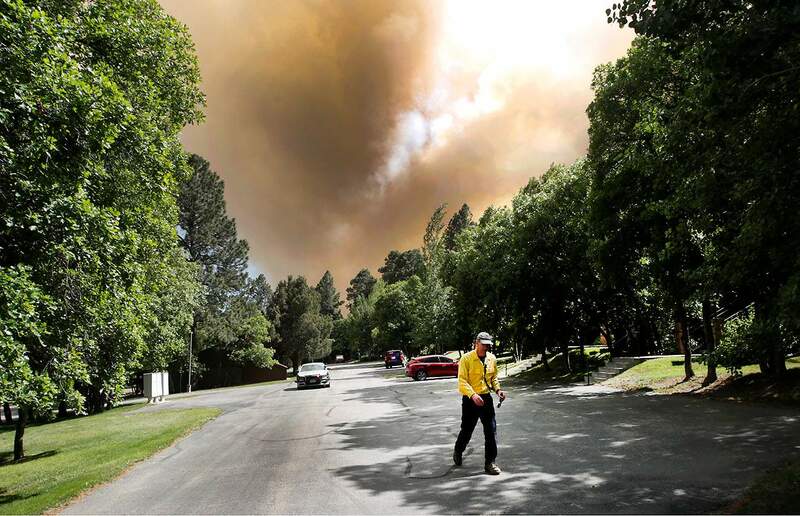 Randy Black, deputy chief with Durango Fire Protection District, goes door-to-door Friday in the Tamarron and Glacier Club area to make sure residents had been evacuated during the 416 Fire. Area hotels are welcoming residents who have been evacuated by the 416 Fire, and some are offering a discount. The Super 8 in Durango hosted about six evacuees Friday night, said employee Tyler Lucero. Lucero said the hotel offered a discount Friday night but was not yet sure if a discount would be offered Saturday night. Most rooms were sold out this weekend at the DoubleTree in Durango, but the hotel will try to accommodate fire evacuees if there is availability, said General Manager Peter Marshall. Marshall said the hotel would offer a discount, just like it did last year for those impacted by the Lightner Creek Fire. The Grand Imperial Hotel in Silverton said it had not seen many evacuees come in, but some train passengers stayed the night. The hotel said it also would offer a discount. Durango & Silverton Narrow Gauge Railroad passengers were held Friday in Silverton because U.S. Highway 550 was closed. The railroad sent buses to pick up stranded passengers, but the buses were forced to take the long route through Mancos, Dolores, Ridgway and Ouray. D&SNG said Friday passengers will receive a full refund. It also canceled Saturday train service and issued a full refund to those passengers.